There are a whole lot of films set and/or made in New Jersey, so we aren’t going to talk about them all. But I’ll eliminate a good deal by not including films made in both NJ and NY. Just dropping Woody Allen NJ and NY films eliminates a whole lot. So let’s try to keep things short by starting with Peter Dinklage. 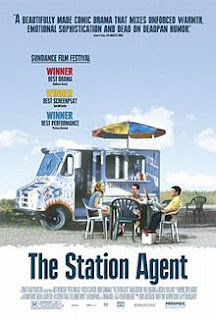 Dinklage’s breakthrough role (long before Game of Thrones and about the same time as his bit role in Elf) came in The Station Agent, the story of a dwarf (as the character describes himself), Finn, who inherits a train station in rural New Jersey and decides to live there (because he has nowhere else to go). 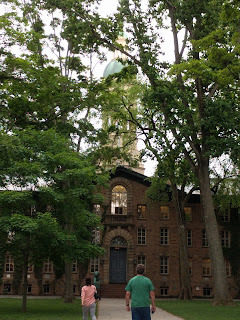 When many think of the Garden State, they think urban, but aside from the opening scene in Hoboken, the film takes place in a lovely, woodsy, small town. The film is not just set in New Jersey, but also filmed there as well. As for churches (see the blog’s name), we see a brief cameo of a church when Dinklage walks through the country. Otherwise there is no church, and there are no clergy in the film but the film is really about the search for community. Finn is isolated by his size and shape. He has a hard time relating to people. He encounters a woman (Patricia Clarkson) isolated by her grief and a man (Bobby Cannavale) isolated by his lack of social skills. The three together eventually find community, the very thing many search for in a church. It’s often a difficult search. Some people have a more built in community in their lives. 1950’s Cheaper By the Dozen, the mostly true story of the Gilbreth family of Montclair, New Jersey. Two parents and twelve children make for quite a community by themselves. The father, Frank, was an efficiency expert who used his children in research on time saving. Sadly, the film was made on Hollywood sets rather than NJ. Other films about real New Jersey residents were filmed in New Jersey. For instance, a couple of members of the Princeton faculty have been featured in major motion pictures. Walter Matthau played Princeton University’s* Albert Einstein in heavily fictionalized comedy, I.Q. The 1994 romantic comedy is more concerned with whether Meg Ryan and Tim Robbin’s characters will hook up than with any theories of physics. Closer to real life, but still off in significant detail is 2001’s A Beautiful Mind. The 2001 drama about Princeton mathematician John Nash and his struggles with mental health. The film won the Oscar for Best Picture, and Russell Crowe won an Oscar playing Nash. It fudges a bit, particularly about Nash’s marriage, but, like I.Q., it was filmed in New Jersey. Of course, plenty of quite fictional films have been set and filmed in New Jersey. Kevin Smith’s career began with the 1994 New Jersey film Clerks, which follows a couple of convenience store clerks who do little of consequence. But they do have a rather awesome conversation about the construction crew on the Death Star in Star Wars. The great French director Louis Malle captured one of Burt Lancaster’s last great roles as a small time gangster trying to protect a young woman (Susan Sarandon) in 1980’s Atlantic City. I’m sure you’ll be pleased to hear the film was set and filmed in Atlantic City. Also set and filmed in Atlantic City: Bob Rafelson’s 1972 cult classic The King of Marvin Gardens with Jack Nicholson. An early film by John Sayles, Baby It’s You, was set and filmed in New Jersey with a soundtrack featuring two of Jersey’s most celebrated troubadours, Frank Sinatra and Bruce Springsteen. Another cult classic with a great soundtrack is 1983’s Eddie and the Cruisers about a fictional rock star who vanishes. And there is, of course, Garden State, which set new trends in wall paper. Finally, I'd like to mention a film that many think is fictional, but actual sites on the internet make it clear the film is actual fact. 1984’s The Adventures of Buckaroo Banzai Across the 8th Dimension tells the story of a brave physicist, test pilot, surgeon, and rock star, Buckaroo Banzai, and his brave struggle against evil space aliens attempting to take over and/or destroy earth. 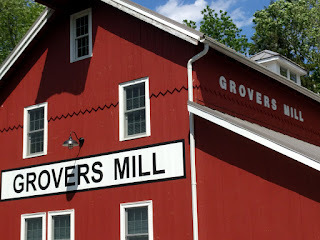 We learn in the film that in 1938, when Orson Welles produced the famous radio broadcast of War of the Worlds, an actual invasion of Grover’s Mill, New Jersey, was taking place -- but Welles was brainwashed by the aliens to say that it was all a hoax. I’d say the film is hardly fiction, but rather hard hitting journalism. But whether true or false, the film is very great fun. Sadly, though it is partly set in New Jersey, and even has a character named New Jersey, it was not filmed in New Jersey. *Our next post will feature the film we saw on the big screen in New Jersey, where we return to the location of A Beautiful Mind.